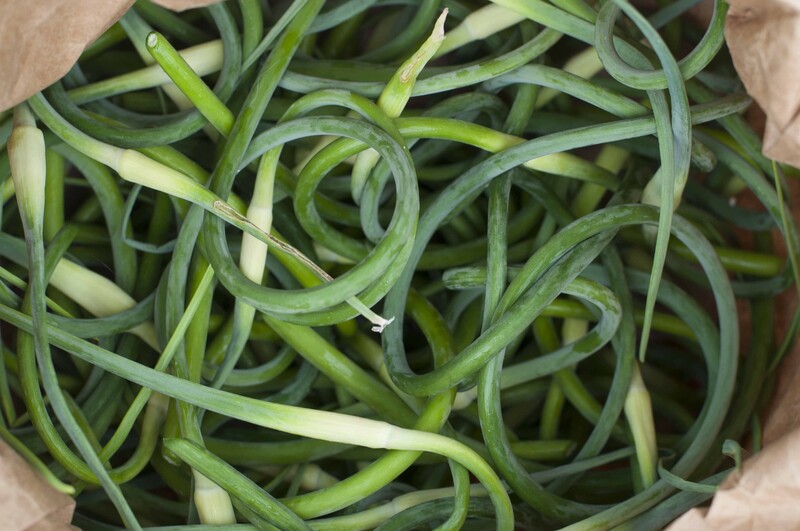 Garlic scapes are beautiful, sure. The floral byproduct of a crop seeded for its bulb, these serpentine swirls have a mild, green flavor and texture somewhere between asparagus and that of a firm, fresh pea. I usually pickle them, make them into pesto, or throw them into a sauté as I would a green bean. But what if they were the main event? A friend brought me a bag of scapes last weekend and had this idea to blanch them and dress them in sesame sauce, kind of like sesame noodles, with the scapes standing in for noodles. 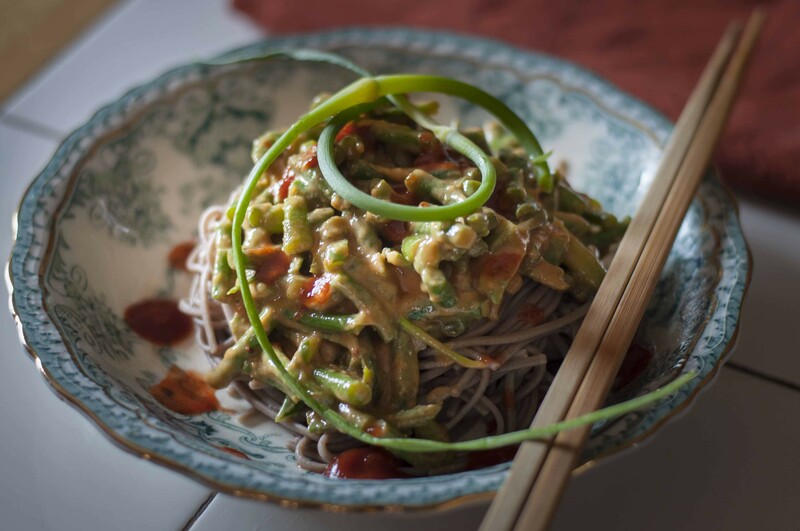 I started with an old sesame noodle recipe from Sam Sifton at the New York Times, which I tweaked extensively. In the end, threw the saucy scapes over noodles for a cool, low-maintenance summer dish that's surprisingly filling. Go figure ... peanuts. Set a pot of water to boil and an ice water bath in the sink. Boil the scapes for 2-3 minutes, until they soften slightly, then plunge into the ice water. After a few minutes, remove the garlic from the water (save the ice water), chop into 1-inch pieces (this should yield about two cups), and reserve. In a medium mixing bowl, combine the ingredients for the sauce and blend until smooth. Add the garlic scapes and mix thoroughly. The mixture should be pretty saucy, since you'll need extra sauce to coat the noodles. Prepare the noodles as directed on the package, then place in ice water bath. Portion a whorl of noodles in a bowl, top with an equal amount of saucy scapes, garnish with Sriracha.